1. 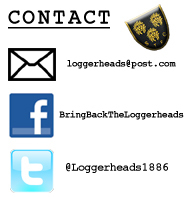 What is the Bring Back The Loggerheads campaign and who is behind it? We are a group of Shrewsbury Town supporters who advocate the return of a club badge which incorporates the Loggerheads emblem and reflects the club’s history, heritage and identity. We are fundamentally opposed to the current club crest on the basis that it has been derived from a clip art package and should not be representing a football club with a proud history spanning over 126 years. 2. What exactly are the Loggerheads? Why are they important? The Loggerheads is a distinctive heraldic crest featuring three leopard heads shown face on. While the animals depicted in this emblem are frequently mistaken for lions, the crest remains synonymous with the town of Shrewsbury due to an association forged over many centuries. 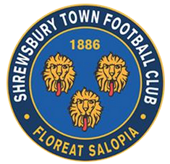 The affiliation between the Loggerheads and Shrewsbury also extends to its football team. Way back in 1907, the Loggerheads formed part of the club’s first ever badge and the famous emblem has since appeared on more STFC shirts than any other crest. The Loggerheads has been (and will continue to be) a fundamental part of the club’s heritage. 3. Is it true that the club requires a copyrightable logo to protect its trademark? What is the campaign’s stance on this? The campaign fully appreciates that STFC should attempt to maximise its revenue streams where possible and that the protection of merchandise has become a staple aspect of modern football. However, we believe that the club could have introduced a new logo which both satisfied the complex requirements of trademark law and yet acknowledged the history of the club and the Town itself. As proven during recent years by clubs like Arsenal, Wigan Athletic and even Swindon Town, it is definitely possible to produce a copyrightable logo which pays homage to the past while managing to protect the commercial interests of the future. 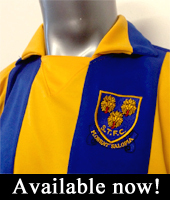 The introduction of a modernised, custom-designed version of the Loggerheads would serve to safeguard a lucrative source of income for Shrewsbury Town whilst also allowing fans to once again wear their badge with pride. 4. Is the new badge really taken from a clip art package? Yes. Shockingly, the yellow lion at the heart of the new logo was taken directly from an online clip art package. This revelation was made public within only hours of the new badge’s inception thanks to a whistleblower posting on the popular blue-and-amber messageboard. 5. From which specific clip art package did the designer obtain the lion now featured within the club’s badge? As far as we can make out, the clip art lion was supplied by a company called New Vision Technologies Inc. On their website, this particular graphic is advertised simply as “roaring lion” and can be downloaded for just £8.25 in British currency. 6. Have the local council banned STFC from using the Loggerheads emblem? No – this is a commonly touted misconception. During the early days of the campaign’s activity, Shropshire Council leader Keith Barrow even stated on Twitter that he would be “more than happy” to allow the club to use the Loggerheads in its badge. Please see the below screenshot for evidence. 7. Several club employees have claimed that the positioning of the Loggerheads (in a triangular formation) makes them impossible to copyright – is this true? While the Bring Back The Loggerheads campaign fully acknowledges the complex intricacies associated with the modern copyrighting process, we have received information to the contrary. In June, we raised this claim with a representative of Design Happy UK (a company with seventeen years’ worth of experience in branding and logo design) and they firmly dismissed it as false. The expert stated with confidence that – if the Loggerheads are custom designed – they can be placed in literally any position without any legal difficulties arising. 8. I prefer the Loggerheads to the current logo, but want to support the club financially by buying a replica shirt. Is there a way I can do this while also showing support for this campaign? There is indeed! We appreciate that there are many STFC supporters who dislike the current badge and yet continue to purchase official merchandise with the aim of providing the club with financial support. However, if you wish to buy a replica shirt without suffering the awkwardness of wearing a clip art logo, we recommend that you contact your nearest embroiderers and they should be able to attach a Loggerheads crest for a nominal fee. The results are always very impressive, as shown below. 9. The new badge was introduced in 2007. Why has it taken five years for a coordinated campaign of opposition? In simple terms, Shrewsbury Town supporters are a very passive bunch. Many fans who took an immediate dislike to the clip art logo were prepared to wait a while in a vain attempt to adjust. It was also naively thought that supporters may grow attached to the new badge given some on-the-pitch success! The fact that this campaign emerged in the aftermath of a promotion should be regarded as a very clear message. Ultimately, despite a truly memorable season, a considerable chunk of supporters still cannot accept that their beloved football club is represented by a piece of clip art tat; a crest so woefully inadequate that it was once described as the “biggest blag since Kevin Ratcliffe”. We would thus suggest that the Bring Back The Loggerheads campaign has stemmed from a constant displeasure which has simmered beneath the surface since the new badge’s inception in 2007. A trawl through messageboard archives reveal that the “badge issue” has cropped up time and time again without any satisfactory outcome. Enough is enough. 10. Has the new logo been successful in preventing the production of unofficial “knock-off” merchandise? Unfortunately not. Shrewsbury fans were initially told that the introduction of a new corporate logo (which was apparently “registered in 14 trademark classes”) would enable the club to clamp down upon those using its crest on unofficial merchandise. This has clearly not been the case – a quick look through eBay reveals a steady stream of opportunistic sellers who have managed to reproduce the new badge with ease on items ranging from fridge magnets to iPhone cases. It would thus appear that this key justification for the arrival of a new badge is a total fallacy; the clip art lion has not facilitated a “gloves off” policy towards online hawkers and should be regarded as ineffectual and unpopular in equal measure. 11. The Bring Back The Loggerheads online petition has received just over 1000 signatures – does this account for only 20% of the club’s total fan-base? We don’t think so. The campaign is very grateful for the extraordinary number of supporters who signed our petition and regard the number involved to be a substantial portion of Shrewsbury Town fans with regular internet access. The statistics presented by the media (in opinion surveys and newspaper polls) are determined by conducting a “Representative Sample” of the populace in which a small number of respondents are asked questions and their answers are multiplied by the potential amount of people in total. Whilst there may be an average of around 5800 regular fans at the Greenhous Meadow, many of these attendees will be youngsters, older supporters or corporate guests who either do not have access to the petition or may not even be aware of its existence. In light of these factors, the amount of signatories on the Bring Back The Loggerheads petition certainly appears to be decisive number. The people have spoken! 12. I heard that it would be too expensive for the club to change their badge – is there any substance behind this claim? While there would obviously be a cost involved with the rebranding of a professional football club, we totally reject the ludicrous estimates made by certain individuals. Firstly, no one would expect the club to immediately replace all items featuring the clip art logo: changing the badge on the shirt, website and matchday programme would be the main priority and would cost next to nothing. Alongside this, there is the fact that much of the club’s branded paraphernalia (e.g. dinner plates, headed notepaper and carpet) has a limited “shelf life” and would require a periodical renewal in any case. As shown in the above chart, there is also some evidence to suggest that STFC may be losing money by persevering with a largely unpopular logo. There are many dozens of supporters who outright refuse to purchase anything featuring the clip art lion logo. In a recent survey carried out amongst the signatories of our petition, a whopping 68% signalled that their spending would increase if Loggerheads merchandise was available for purchase. We suggest that, by reinstating the Loggerheads, the club would eventually recoup any costs it incurred during a much-needed rebranding process. 13. Would the Bring Back The Loggerheads campaign be satisfied with a modernised version of the Loggerheads appearing as part of a copyrightable club badge? Yes, of course – so long as any new crest incorporates all three leopard heads in the same triangular formation which many Town fans have grown to know and love. We would be delighted with such a compromise. 14. Is the Bring Back The Loggerheads campaign having a detrimental impact on STFC players? No, absolutely not. We are 100% behind Shrewsbury’s players and always will be. Many involved with our campaign offer unequivocal vocal support at both home and away games. We vehemently deny this ridiculous accusation and regard it as grossly offensive. Valuing the club’s heritage is not a crime. 15. Surely on-the-pitch matters are more important than the club’s choice of badge – shouldn’t you concentrate on the team instead? We are all passionate Shrewsbury Town supporters and obviously take a great interest in the team’s fortunes. However, caring about league position and preferring a traditional club badge are not mutually exclusive – you can do both at the same time. There is far more to a football club than just eleven players and three points on a Saturday afternoon. Tradition, identity and heritage are equally important to many fans. 16. “A badge is just a badge, it’s never won us any games” – what is the campaign’s response to this mentality? Frankly, we think it’s a ludicrous sentiment. No one is suggesting that reinstating the Loggerheads would in any way affect our league position, but to dismiss the club’s emblem as “just a badge” is symptomatic of the blinkered commercialism which has poisoned our national sport. The badge constitutes a large part of the club’s overall identity – along with blue and amber stripes and Catch Us If You Can – and should not be casually disregarded as a trivial matter. We would advise anyone making similar comments to remember that on-the-pitch success is only ever temporary, whereas a club’s soul lasts forever. 17. And was the campaign ultimately successful? Yes! 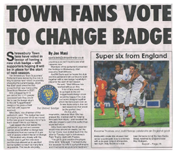 In 2014, the Supporters’ Parliament coordinated a vote amongst Shrewsbury Town supporters about whether the clip art badge should be removed. Of a total 1171 votes received, a whopping 91.5% voted in favour of change. The club accepted this landslide result and produced four shortlisted badge designs which STFC fans could for. On Saturday 20th December 2014, the following badge was declared the winner and will be in place for the 2015/16 season. A great result and a victory for common sense, our club’s identity and the campaign itself. The results of the 2014 Badge Vote have been officially announced. 1171 votes were received and a staggering 91.5% have voted in favour of removing the clip art lion. This is a great victory for our club's identity. Thank You to everyone who voted 'YES'.